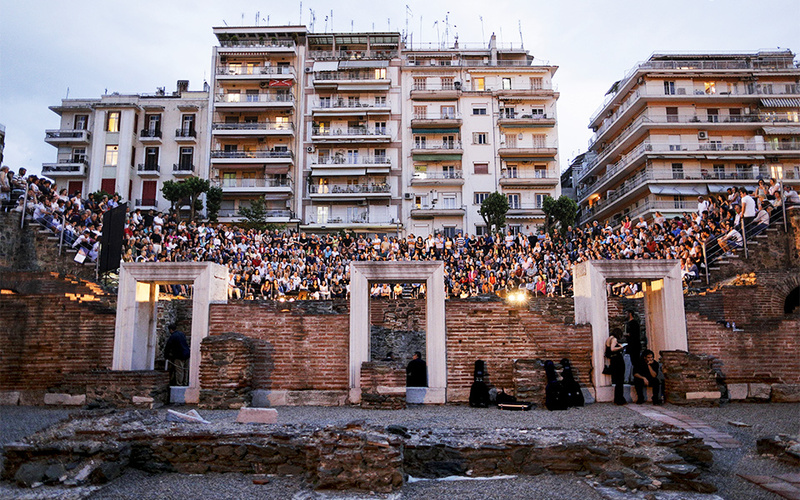 Attending a performance at the Odeon of the Roman Agora makes for a truly extraordinary evening out. Rich in monuments and memory, the area around the Roman Agora is once again the most happening stretch of town. Τhe tiled domes on the roof of the 15th-century Bey Hamam make for a strange and beautiful setting for a morning coffee – all nostalgic among the pine trees. 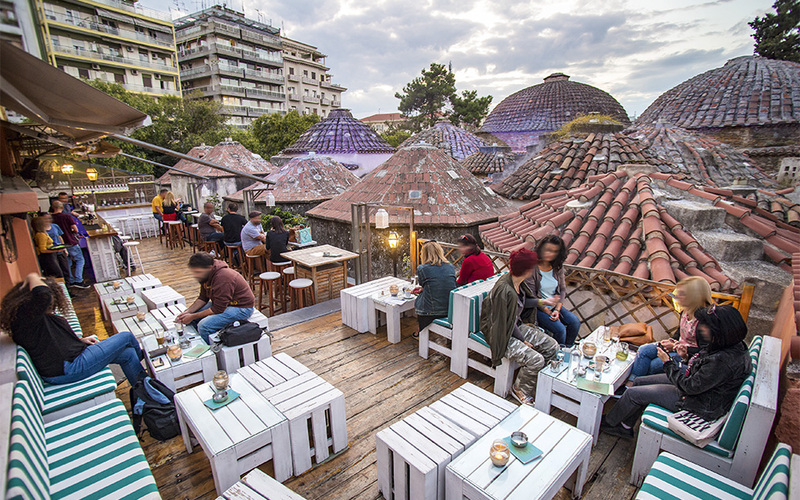 Just on the other side of Egnatia Street, with its thick traffic, lies contemporary Thessaloniki – elegant Aristotelous Square leading to the international shopping thoroughfare of Tsimiski Street, and then on to the waterfront and its mostly modern cafés. Here though, above Egnatia, it’s another world, cosmopolitan in the truest sense. This is a neighborhood with a pedigree. Thessaloniki’s many moods stylishly converge around the Roman Agora. This atmospheric, architecturally complex swath of town is diverse in all senses of the word, yet decidedly low-key. History comes served with coffee on the beautiful rooftop terrace of the Palio Hamam Café Bar. A richer slice of urban landscape would be hard to find. It’s dense with memory and with landmarks – historic, spiritual and cultural – spanning the city’s centuries. The Bey Hamam, with its rooftop café, is in the southeast corner of Dikastirion Square. From here, you can see the Roman Agora with its Odeon and Cryptoporticus, the hub of city life from the 2nd to the 4th centuries AD. 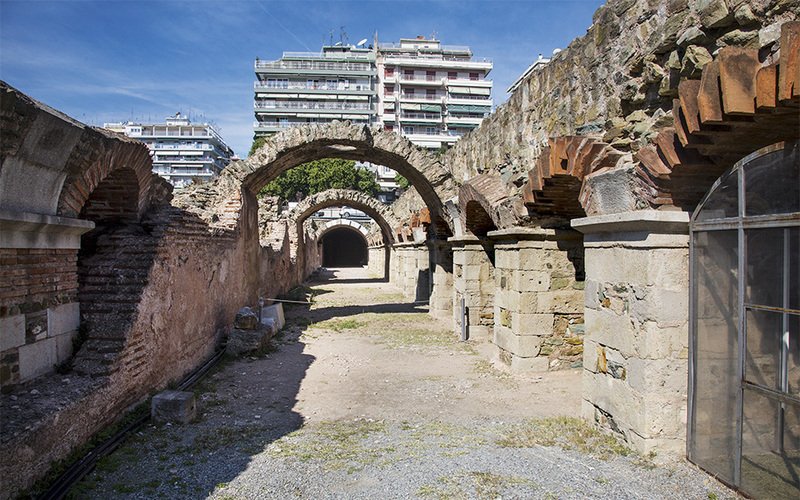 Right in this area, somewhere between the Bey Hamam and the Roman Agora, stood Thessaloniki’s equivalent of the Caryatids, more commonly known by the Judeo-Spanish name of Las Incantadas (“the enchanted ones”). Erected in the 2nd or 3rd c. AD, they were carted off to the Louvre by Emmanuel Miller (a sort of a French Lord Elgin) in 1864. 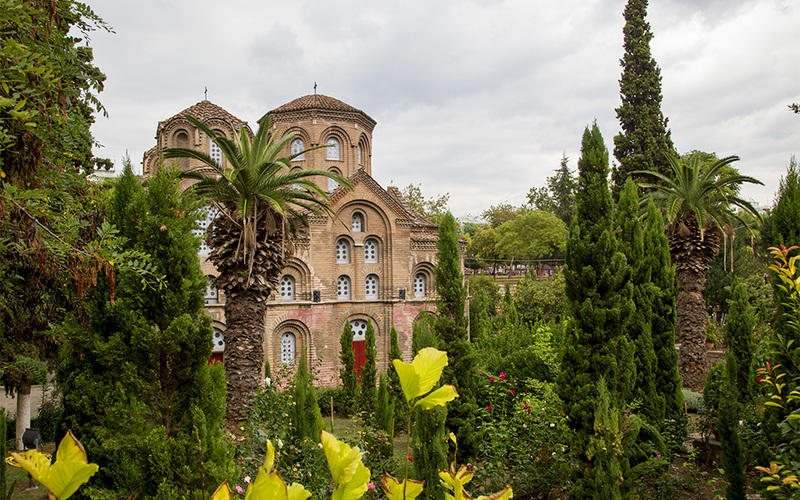 Across the park, partially sunken below street level, is the 11th-c. Church of the Panaghia Chalkeon (The Virgin of the Coppersmiths), surrounded by its rose garden. The Church of the Panaghia Chalkeon. All these places are relevant to the contemporary life of the city. Older gentlemen remember coming to the Bey Hamam for a traditional steam bath. It only closed its doors in 1968. Las Incantadas are not forgotten – the playground where they once stood is named “I Magemenes” (as they are called in Greek) in their memory. Everyone still flocks to the Roman Agora for occasional concerts and cultural events. And the Church of the Panaghia Chalkeon is named so because when the church was built this was the neighborhood of the coppersmiths (it would become the Mosque of the Coppersmiths in the Ottoman era). 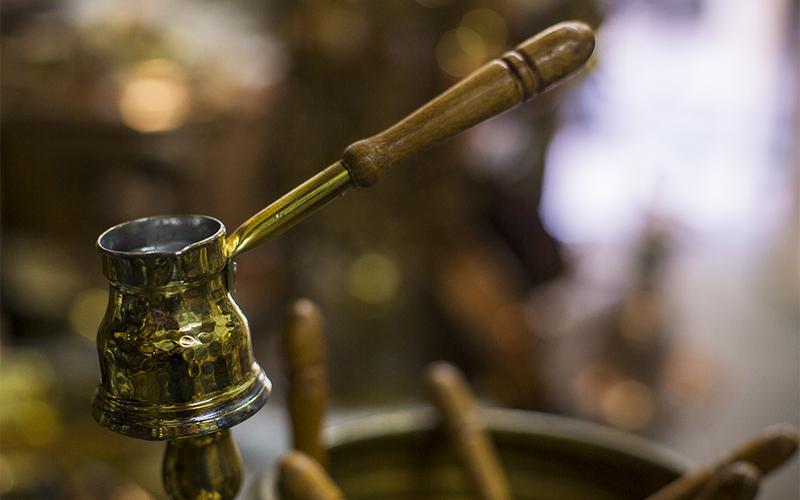 Today, half a block away on Kleisouras Street, you can still get a handcrafted copper briki (“pot”) for making Greek coffee, made by third-generation coppersmith Pavlos Papoutsidis. He hopes his own grandson will take over the shop one day. 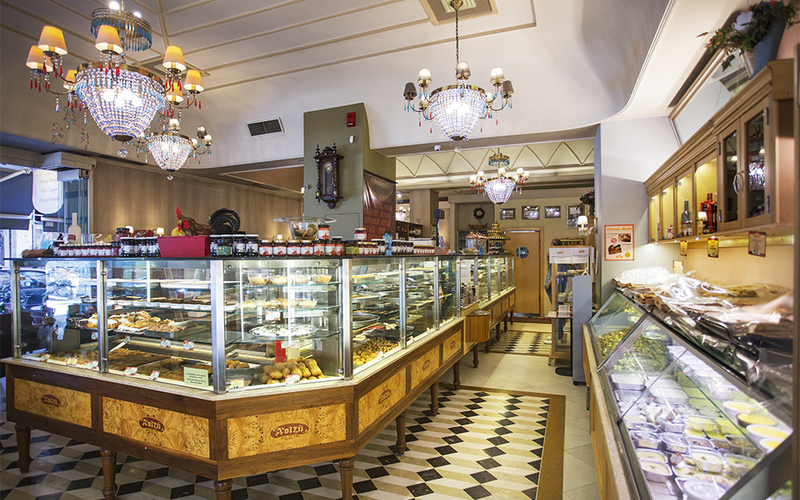 At the end of Kleisouras, on Venizelou Street, stands Chatzis’ pastry shop, a local institution that has been on this street since 1908. Guardians of authenticity, they spare no effort to make their Constantinople-style syrup pastries and creams. They also serve boza – made from fermented millet, this was the first soft drink of the Balkans. The present owners are themselves descendants of a bozatzis, a peddler of the refreshment who carried a stamna (a clay vessel that kept the liquid cold) strapped to his back, right here on Sabri Pasha Street (since renamed Eleftheriou Venizelou). Boza truly is a taste from a lost world. The Roman Agora’s Cryptoporticus was fronted by an ancient shopping street that ran along the north side of what is today Filippou Street. Eleftheriou Venizelou is one of the main streets of the neighborhood. 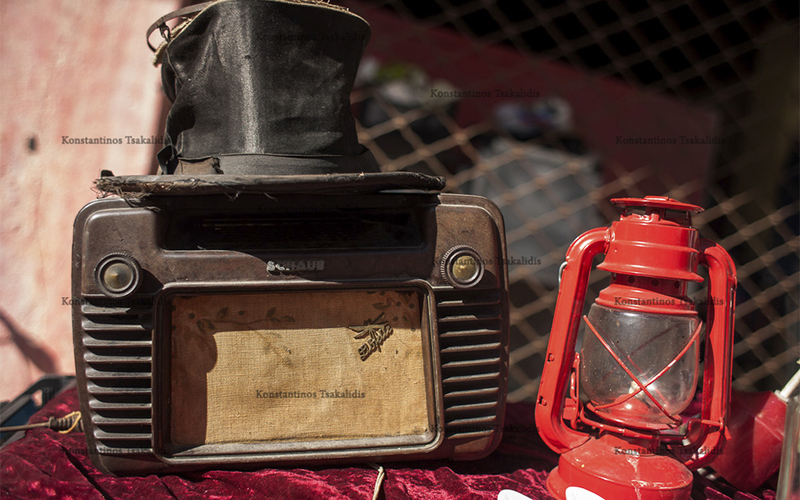 Once crowded with street vendors, it hasn’t left its past entirely behind. Now and then you’ll find an old gentleman set up on the sidewalk with bundles of oregano and dried sage. The first kiosk on your right as you come up from Egnatia sells antiques along with the usual soft drinks and cigarettes. Sabri Pasha was a main shopping thoroughfare, widened at the initiative of the pasha, leading all the way to the waterfront from the Konak (Governor’s residence). Now the Ministry of Macedonia and Thrace, this thoroughly European building was erected in 1891 by Thessaloniki’s favorite turn-of-the-century architect, Vitaliano Poselli. This was a major hub long before that, however: the Hamza Bey Mosque of 1468 (also known as the Alkazar after the cinema it housed in the mid-20th century) is at the intersection with Egnatia. The old caravanserai – an inn offering rooms for travelers and stables for their animals – was right here, too. The neighborhood’s history and authenticity is a rich source of inspiration for its present. The Caravan Bed & Breakfast, very nearly on the site of the old caravanserai, taps into this spirit of ur-hospitality. 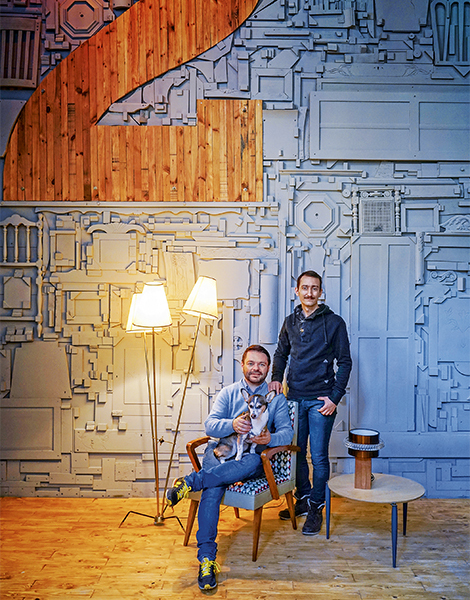 The inviting eclecticism of the lounge – open to all for coffee and cocktails – comes from more recent decades, comprised of the owners’ families’ furniture as well as industrial design pieces. Fragments of the past are used to create a contemporary aesthetic at 2 Concept Store. 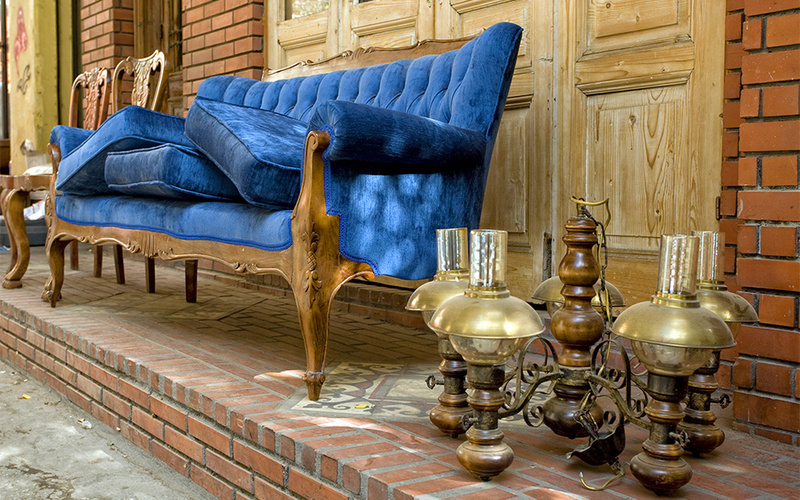 Up the block at 2 Concept Store, you’ll find more gorgeous examples of Greece’s 20th-century design heritage. 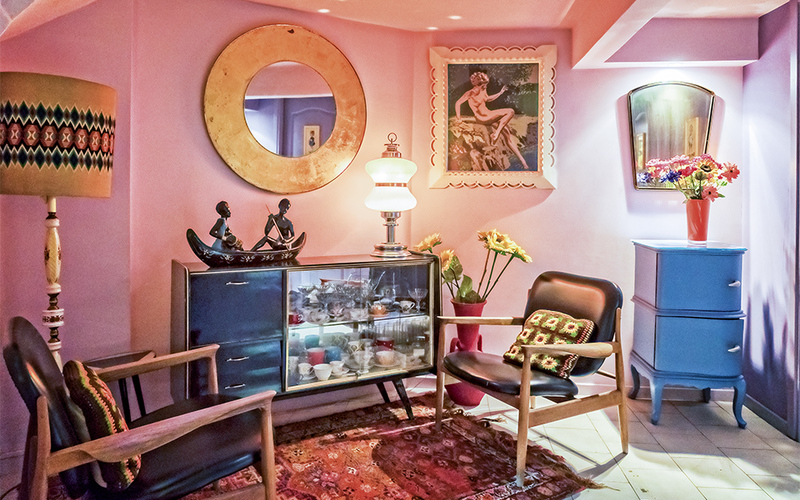 Rediscover the definitive cool of the mid-century in beautifully restored pieces of furniture which the store-owners have rescued from oblivion and are offering for sale in their showroom, or just have a drink in their well-appointed café-bar. 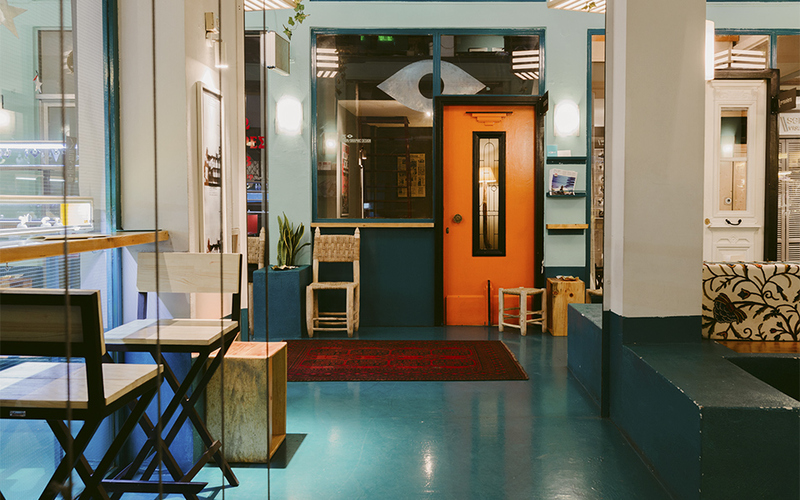 The establishment also hosts excellent exhibitions of art and design in its downstairs space. 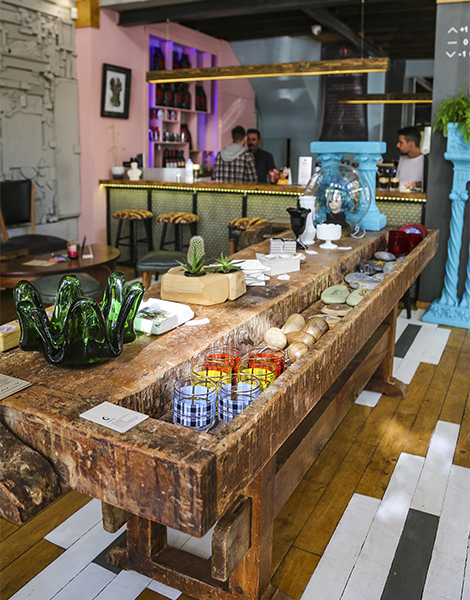 A block down on Egnatia, at the back of an arcade in an office building, you’ll find a cool blue oasis of style at Bord de l’eau, by day a great coffee spot and by night a place where DJs spin and cocktails abound. But the main attraction is what it calls its “design factory,” where third-generation jeweler Yiannis Gounaridis crafts surreally beautiful things. His sterling rings from the “Animalism” series will certainly catch your eye. Heading back towards the Agora leads you through one of the city’s favorite atmospheric corners, the Bit Bazaar. In a courtyard accessed from Tositsa Street and spread out along the street itself, the paliatzidika (“junk shops”) make for nice browsing. 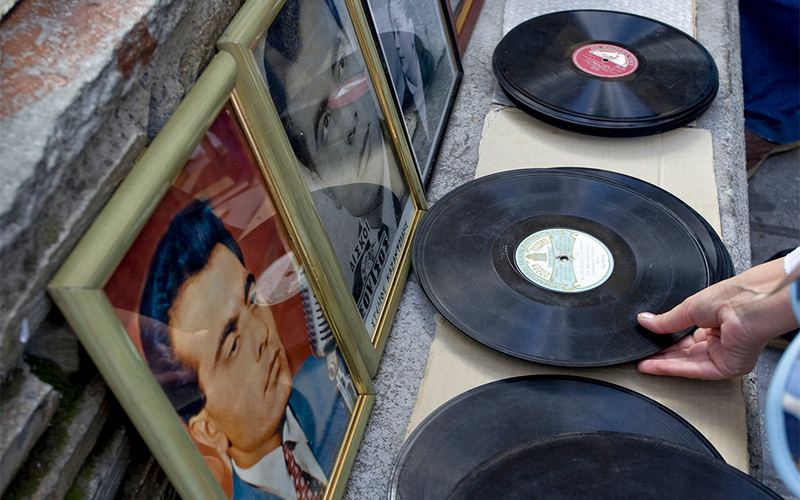 The antique black-and-white postcards on Tositsa near the bazaar entrance are a bargain at a euro apiece. If your stroll has put you in a vintage mood and you want to dress the part, visit the Vaudeville Room, a high-ceilinged, prewar apartment filled with choice clothing, accessories and jewelry from the 1930s to the 1980s, sourced from London, Budapest and now Berlin (some of the furniture here is from the guys at 2 Concept Store). 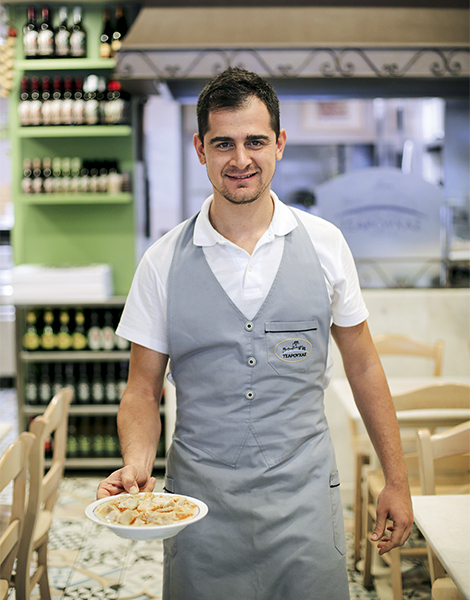 Right up the street on Olimpou, you can try a strong serving of tradition at Tsarouchas. The city’s oldest patsatzidiko, it specializes in the collagen-rich elixir of patsas, tripe-and-veal trotter soup, which is famous for keeping hangovers at bay. (There are also plenty of more conventional home-style dishes for the less adventurous.) By night, this corner of the neighborhood is full of students who flock to the many small, casual places to share wine by the carafe. Loux Café recalls the past elegance of the neighborhood. These broad-shaded streets are some of Thessaloniki’s loveliest. The area between Aghios Dimitrios and the ever-chic Aristotelous Square, with parks that afford open vistas all the way to the sea, once offered some of the city’s most elegant living. The neighborhood fell out of fashion in the late 20th century, but grand neoclassical and art deco façades preserve its original tone. Filippou Street, just east of the Agora, has a fine stretch of them, starting at No. 39. The neighborhood’s authentic character appeals to a new generation on this side of the park, too, with businesses that draw inspiration from its different eras. 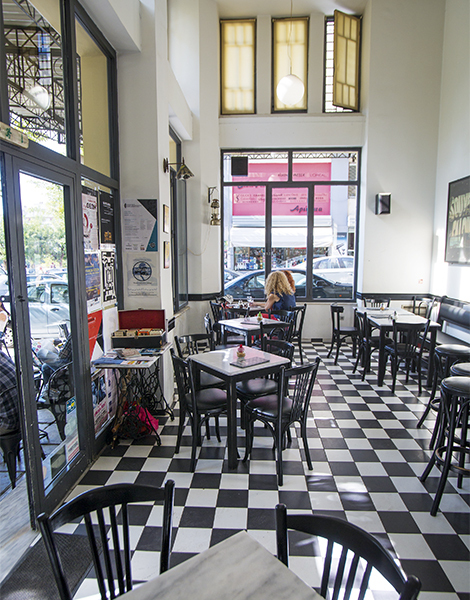 Near the northeastern corner of the Roman Agora, the high ceilings and black-and-white interior of the Loux Café capture an early 20th-century elegance, while the nearby café/bar Frederiko is all mid-century polychrome charm. Clothing designer Eleni Chasioti’s collections of bespoke and ready-to-wear nostalgia are inspired by the swing era of the 1930s and 1940s, making them right at home in the historic building housing her atelier. Her neighbors at Seikilo look back much further. 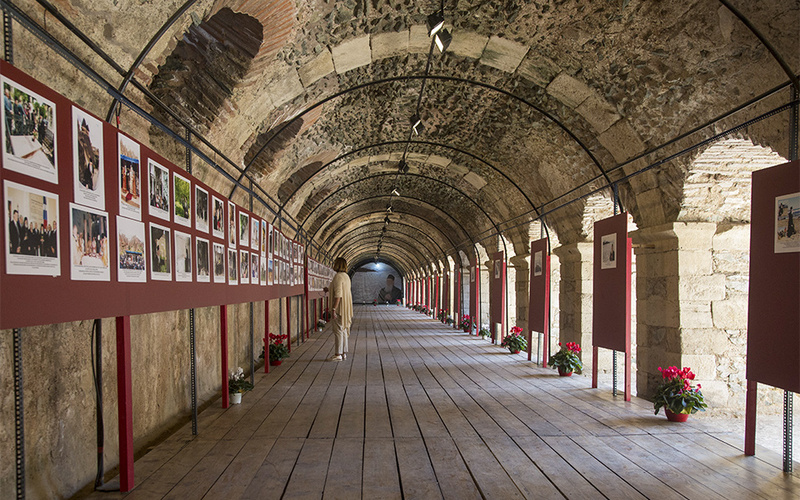 “Being just steps from the Roman Agora is really inspiring,” says Theodoros Koumartzis. His family brings the sounds of the ancient world to life through beautiful and historically accurate reproductions of lyres and harps. They also make ancient board games; you can sharpen your battle strategy with Petteia, like Achilles did. 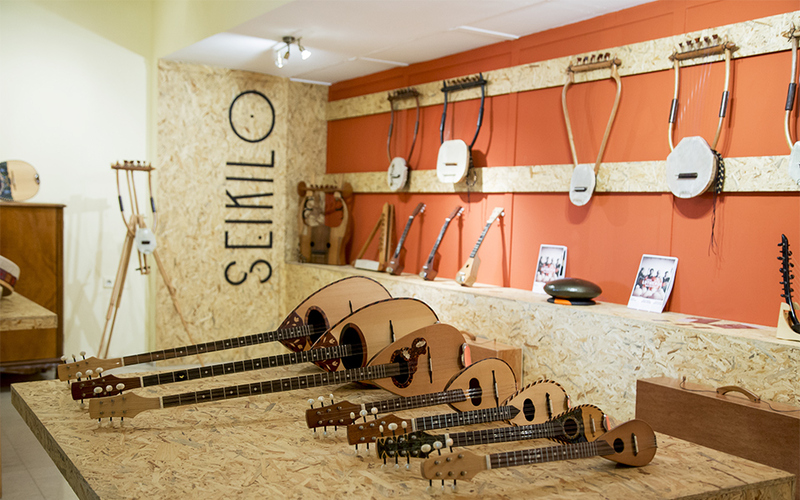 Right next door to Seikilo is Nitra, the perfect expression of the neighborhood’s vibrant soul. A respected contemporary art gallery whose vision is firmly grounded in the present, Nitra has a deep attachment to the location’s past. Konak (Aghiou Dimitriou) Originally built as the Governor’s residence by Vitaliano Poselli towards the end of the Ottoman era, this impressive structure now houses the Regional Authority of Macedonia and Thrace. Bit Bazaar (Tositsa) This slightly dusty, treasure-filled square built during the 1920s is worth seeking out. Open regular store hours. Roman Agora (Filippou & Agnostou Stratiotou) The neighborhood’s spiritual heart is a splendid archaeological site, and don’t miss its museum – the entrance is in the NW corner of the site. Tel. (+30) 2310.221.260. Open 8:00-15:00 (winter hours 9:00-16:00, Mon closed) Admission €4. 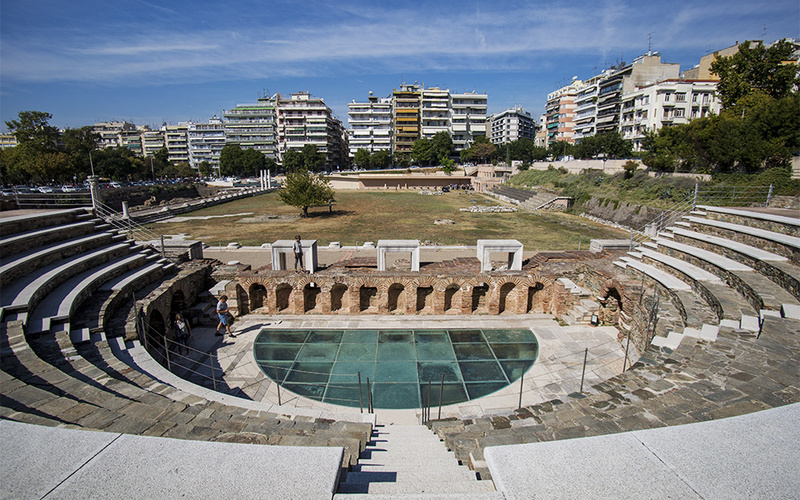 Bey Hamam Sometimes called the Paradise Baths, this was the first bath house built by the Ottomans in Thessaloniki. The baths are closed, but you can visit the Palio Hamam Café (Egnatia & Mitropolitou Gennadiou). Aristotelous Square Planned by Ernest Hébrard after the fire of 1917 but only realized in the 1950s, this graceful waterfront plaza is the city’s liveliest gathering spot. Caravan Bed & Breakfast, 1 Rempelou & Dimarchou Vamvaka, Tel. (+30) 2313.062.780. Open daily 7:30-22:00. Chatzis, 50 Eleftheriou Venizelou, Tel. (+30) 2310.279.058. Open daily 8:00-01:00. Frederiko Agapi Mou, 87 Olimpou, Tel. (+30) 2310.238.532. Open daily 10:00-02:00. Loux café, 83 Olimpou, Tel. (+30) 2314.012.381. Open daily 9:00-02:00. Palio Hamam café/bar, Egnatia & Mitropolitou Gennadiou, Tel. (+30) 2310.222.460. Open daily 9:00-02:00. Tsarouchas, 78 Olimpou, Tel. (+30) 2310.271.621. Never closes. Pavlos Papoutsidis, copper and bronze goods, 10 Kleisouras, Tel. (+30) 2310.279.073. Open regular store hours. 2 Concept Store, 2 Rempelou, Tel. (+30) 2310.265.999. Open Mon-Sat 9:00-21:00. Vaudeville Room, 3 Karmpola, Tel. (+30) 2314.019.045. Open Mon-Fri 11:00-21:00, Sat 11:00-18:00.